Since the last update, the New York State Museum archaeological research team and volunteers finished soil excavation and sifting for artifacts. They uncovered an artifact that may be associated with a kiln used in the production of pottery. This would be significant since very few pottery operations North of New York City are known for the earlier years of this home's occupation. 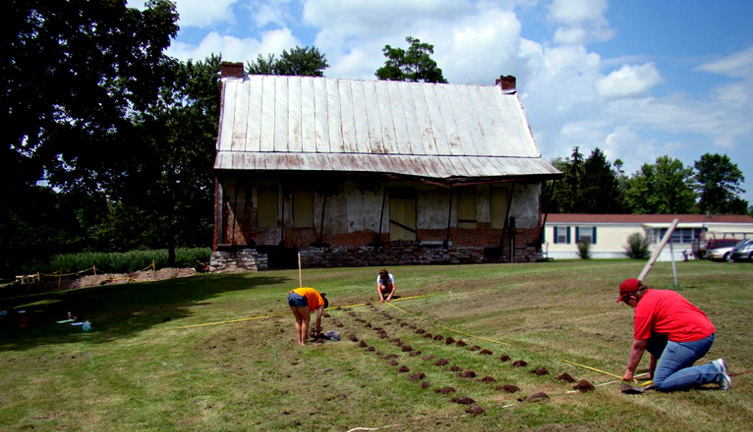 On August 5, 2011, the NYS Museum team conducted minimally-invasive measurements of soil in what was once the back yard of the Van Hoesen House. 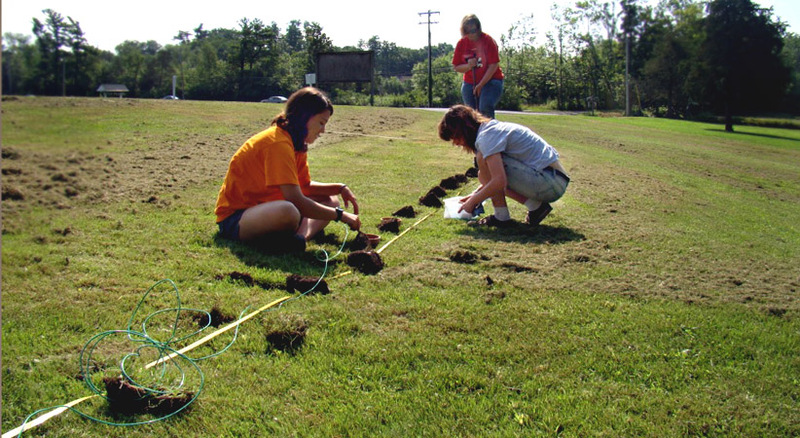 They used a method known as a self-potential [SP] survey to detect the presence of any underground features including buried artifacts and soil impressions left by earlier structures. These surveys revealed underground features which will impact future decisions regarding excavation or construction near the house. These findings may eventually help determine the year of the house's construction. The best information now suggests a construction date around 1740. Photos of the SP process are shown below. 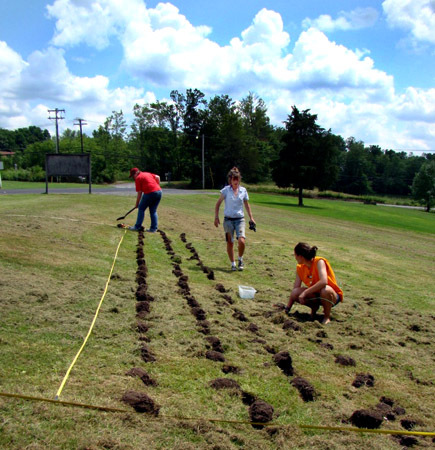 Once the archaeological work was completed, volunteers dug a drainage trench. Then on Friday August 12, installation of the drainage pipe was begun as shown in photos below. The pipe will serve to remove some of the excess water from the basement without destabilizing the soil underlying the foundation. The pipe will also carry rainwater from the roof's gutter system. On the Saturday after these photos were taken, the pipe installation was completed, the trench was filled and grass seed was planted. The next step is to dig the basement portion of the drainage system. As part of that work, an archaeological assessment will be conducted to ensure that any important buried artifacts are properly collected and studied to learn more about the history of Van Hoesen House. 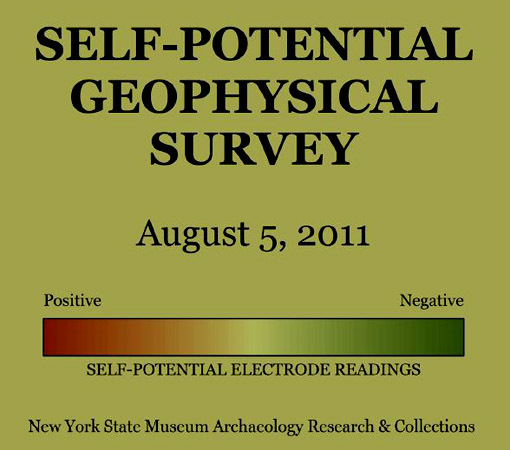 The geophysical technique we employed at the Van Hoesen House is actually called a self-potential [SP] survey. Using home-made electrodes constructed of flower pots filled with a copper sulphate solution, we were able to measure changes in electrical current in the earth's surface. Voltage measurements were taken every half-meter along a 6 m x 10 m grid in what would have been the backyard of the original house (now the front). In order to obtain accurate voltage readings, the electrodes needed to come in contact with bare soil, so small divots of sod were removed, but no actual excavation took place. Here is a simple explanation I know of on how an SP survey is believed to work - it was written by Bruce Bevan, a geophysicist. "Water which contains a small amount of salt becomes ionized; when this water moves through the soil, the moving charged particles are an electrical current. These currents create voltages which can be measured at the surface; even the very slow movement of water seeping in the soil can generate detectable voltages. 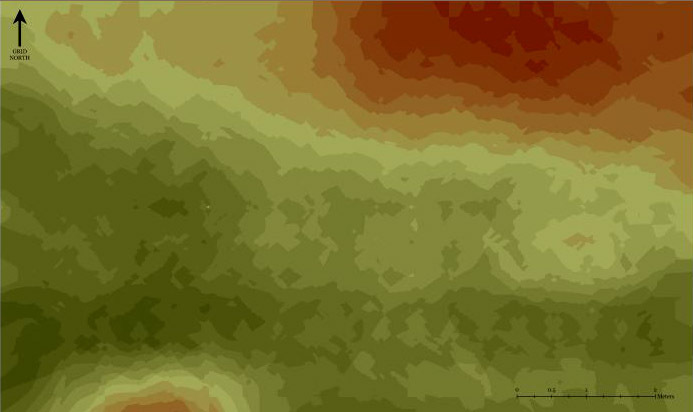 Since archaeological features can cut into natural soil strata, they can alter the rate at which rain water will seep through the soil; these earthen types of features might be detectable with an SP survey."